FORT WASHINGTON, Pa.-Nutrisystem, Inc. (Nasdaq: NTRI), a leading provider of health and wellness and weight management products and services including Nutrisystem® and South Beach Diet® brands, today announced the launch of DNA Body Blueprint™, a genetic-based product using a proprietary algorithm that provides an integrated personal action plan focused on eating behaviors, nutrition and metabolism. The national marketing campaign will debut this week. As a leader with a history in innovative and scientifically-backed weight loss solutions, Nutrisystem greenlighted the creation of DNA Body Blueprint based on a thorough assessment of market dynamics and scientific reviews from its Science Advisory Board. The board consists of a team of renowned professionals, each with distinct backgrounds and expertise, who helped evaluate existing research to enhance current programs, as well as develop new programs utilizing the latest science and technology trends within weight management. The Company worked closely with and entered into an exclusive agreement with Genetic Direction, a leading provider of DNA-based health management programs, to develop a simple and secure DNA test that uses advanced genetic testing technology and genomic analysis to create an innovative and comprehensive product in the weight loss and weight management space. Proprietary algorithms were designed to accurately analyze genetic variants known as single nucleotide polymorphisms (SNPs) that may affect absorption and uptake of nutrients, processing of nutrients, metabolism, behaviors and optimal fitness approaches. For example, customers will discover whether they are more genetically inclined to lose weight and maintain weight loss, whether they have a slower or faster metabolism, and how their body processes macronutrients such as carbohydrates, fats and proteins, and what to do about it. Customers will be able to discuss their personalized report with a weight loss counselor and tailor their program based on the report findings. Nutrisystem, through Genetic Direction, will be utilizing AKESOgen, an industry leading global genetic testing lab, to provide data and results using the most secure data encryption technology available, including de-identified samples and barcode matching. 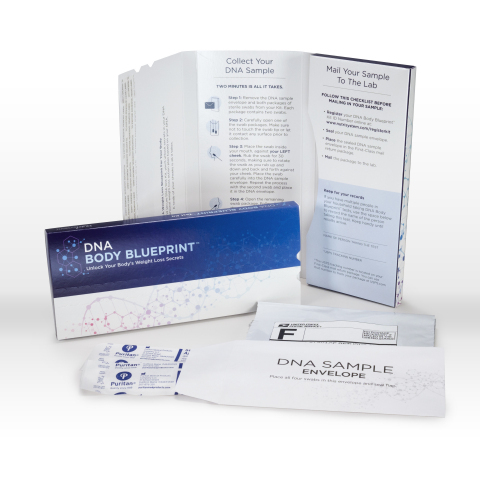 DNA Body Blueprint is slated to be prominently featured in national multi-media marketing and advertising campaigns debuting today, July 16. View one of the Body Blueprint DNA national television ads here. The Science Behind Nutrisystem® DNA Body Blueprint™ White Paper can be found here. Additional information on the Nutrisystem DNA Body Blueprint can be found here along with a fact sheet, here. Nutrisystem, Inc. (Nasdaq: NTRI) is a leader in the weight-loss industry, having helped millions of people lose weight over the course of more than 45 years. The Company’s multi-brand approach to weight loss includes multiple plans for 2018. For more information, go to NutrisystemNews.com and Newsroom.SouthBeachDiet.com. Genetic Direction is a healthcare software company that improves individuals’ lives by evaluating key genetic markers and developing personalized health management programs in the areas of weight management, healthy aging and peak athletic performance. Genetic Direction’s proprietary algorithms and protocols utilize the latest peer-reviewed genetic research and are delivered to consumers, clients and patients through healthcare providers, retail marketing partners and directly via its secure web platform and one-on-one telehealth consultations. 8th May 2018: Oxford & Manchester, UK and Atlanta, GA. Cytox, a precision medicine testing company which today is commercializing polygenic risk scoring (PRS) and other approaches for assessing genetic risk for developing Alzheimer’s disease, has collaborated with integrated genomics and genetics leader AKESOgen to verify the performance of the Cytox genoBAR™ test with saliva samples. The Cytox genoBAR research test is intended to help pharma, biotech, and sponsors of large cohort studies reduce the time and high cost associated with identifying and stratifying subjects for clinical trials and large-population research, which can take more than six months and run tens of thousands of dollars per participant. The work performed by Cytox and AKESOgen resulted in over 99% concordance between the SNPs used in the PRS identified from blood and saliva samples collected from the same subjects and run on the Cytox variaTECT™ microarray on the Applied Biosystems™ GeneTitan™ Multi-Channel (MC) instrument platform from Thermo Fisher Scientific. The saliva samples were collected using the DNA Genotek DNA saliva collection kit. The results of this verification study will provide an additional means to collect DNA from prospective clinical trial and cohort subjects and opens the possibility of screening even larger population groups for disease risk. Cytox Group Limited is a precision medicine information company whose mission is to transform how treatments are developed, people are screened and therapies are prescribed for the most prevalent neurological diseases, including Alzheimer’s disease. Alzheimer’s disease today impacts over 46 million people globally, reaching 74.7 million in 2030 and projected to grow to over 131 million people by 2050 with an economic impact to exceed two trillion dollars. Leveraging the proprietary Cytox variaTECT™ SNP genotyping array, Cytox SNPfitR™ algorithm for polygenic risk scoring and running on the proven power and scalability of the Applied Biosystems™ GeneTitan™ Multi-Channel (MC) Instrument platform, the company offers genomic profiling testing assays and services to early access collaborators in academia and Biopharma pursuing clinical research and drug development. The service is designed to help researchers and clinicians access the biology and genetics behind dementia, stratify patients to enable more cost effective and information rich clinical trials, and ultimately establish risk for cognitive decline and matching with the most appropriate targeted therapy. The company is headquartered in the United Kingdom with assays and services available to early access collaborators globally. For more information, please visit www.cytoxgroup.com and follow the company on Twitter at @CytoxDx and on LinkedIn. Cytox’s assay and testing services are for research use only and not for use in diagnostic procedures. ATLANTA – March 19, 2018—AKESOgen was recognized by the state of Georgia as a Small Business Rock Star today at a luncheon hosted by the Georgia Department of Economic Development (GDEcD) and the Georgia Economic Developers Association (GEDA). Genetics and understanding your own genetic make up (DNA) is becoming pervasive in society. i.e. what makes you who you are. We are applying these new genetic technologies in fields such as cancer and Alzheimer’s as well as consumer genomics.” said Dr. Mark Bouzyk, Chief Scientific Officer at AKESOgen. “We are offering new precision medicine testing to understand outcomes and help identify which medicines make sense for the patient. In order for us to have grown this critical business we are deeply indebted to the outstanding support of GDEcD, Partnership Gwinnett, Georgia’s Innovation Crescent, the Georgia Research Alliance and GeorgiaBIO”. This year’s Small Business Rock Stars winners include: AKESOgen, Inc. from Gwinnett County; STRAND Clinical Technologies from Columbia County; Gottwals Books from Peach County and SouthLife Supply Co. from Thomas County. These companies have shown increases in revenue, sales, exporting, product lines, jobs and economic impact. Additionally, the Small Business Rock Stars have shown dedication to their entrepreneurial spirit, creativity and a unique approach to conducting business to take them to the next level. Governor Nathan Deal declared March 19-23 as Georgia Small Business Week to celebrate the achievements made my small businesses throughout the state. The Georgia Department of Economic Development’s small business efforts and outreach are directed by GDEcD Director of Entrepreneur & Small Business Mary Ellen McClanahan. To access more information about these programs and more visit www.georgia.org/rockstars and www.georgia.org/smallbusinessweek.